Trained as Italy's first female physician, Dr. Maria Montessori is best known for her creation of an educational system, introduced in 1907, that was a revolutionary approach to the way children were educated. Through her pioneering research, she created a system that addresses the development of the whole child and is rooted in the belief that all children possess an intellectual and creative potential, a drive to learn and the ability to be self-directed. In carefully prepared classroom environments, children are grouped together in age spans of three years where they learn the important dual roles of following, then leading. A highly organized, yet individually flexible curriculum allows for the accommodation of varying academic capabilities. 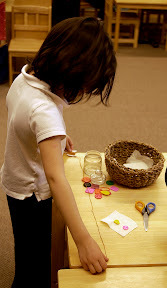 The Montessori classroom prepares its students for each successive developmental plane. The seeds planted in the lower levels come to fruition in the upper levels. Most importantly, the Montessori environment prompts children, under the careful guidance of their teacher (referred to as a Guide), to take initiative in their own education by making choices, developing self-respect and learning accountability to others. An authentic Montessori program is characterized by the following traits. Classes are multi-aged, multi-graded heterogeneous groupings of students based on planes of development: Casa for ages 3 - 6; Lower Elementary for ages 6-9/Grades 1-3; Upper Elementary for ages 9-12/Grades 4-6. Guides with accredited training in the Montessori philosophy and methodology appropriate to the age level of the students work with their students for three years. A diverse set of Montessori learning materials, activities and experiences guide discovery and foster physical, intellectual, creative and social independence. A prepared environment encourages intrinsic motivation, spontaneous activity and self-directed learning. The environment engages and supports the child. Students are met at their individual skill levels, presented appropriate lessons, and given time to practice and reinforce concepts. Once mastery is achieved and the student has felt success, the child is eager for the challenge of the next level. Classroom atmospheres encourage social interaction for cooperative learning, peer teaching and emotional development. Instruction is not divided into specific time frames associated with a particular subject area or activity, but taught in an integrated fashion. The cosmic curriculum emphasizes study of the whole, then its parts, helping a child find connections and relationships in their world. Curriculum emphasizes peace education and care of the environment as part of understanding our place in the world and creating responsible citizens. The daily schedule allows large blocks of time to problem solve, observe and understand interactions and connections in knowledge and to create new ideas. Schools demonstrate respect for the child through policies and actions.